In the 1850s Beechworth was a booming gold town in which close to 9,000 people dug gold out of Reedy Creek in Woolshed Falls. Ned was a frequent visitor – both for social purposes and court appearances. Eighty-five tonnes of gold were found over 14 years. 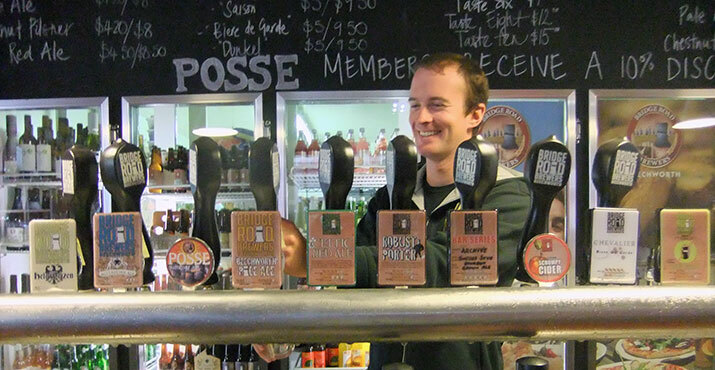 In the 21st century Beechworth is still gold. Boasting the beautiful backdrop of the Ovens Valley countryside, Beechworth has it all: striking gold-rush architecture for the admirer of art and architecture, delicious cafes and wine choices for the gourmand, and perfect cycling and bushwalking trails for the adventurer. 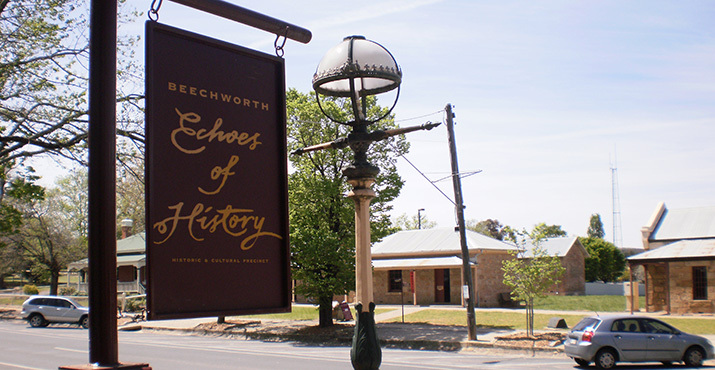 Today, Beechworth is perhaps Australia’s best-preserved gold town and its legacy of the gold-fever years is still evident from the remaining alluvial gold that can still be panned in the creek – to the town’s mineshafts – to the Chinese Burning Towers. And, of course, the graves in the Beechworth cemetery, a final resting place for about 2,000 Chinese who had come to make their fortune. The cemetery also contains graves of war veterans and pioneers but does not hold the body of Burke (from Burke and Wills fame) who, in the early days of the gold rush was the superintendent of the Beechworth police. 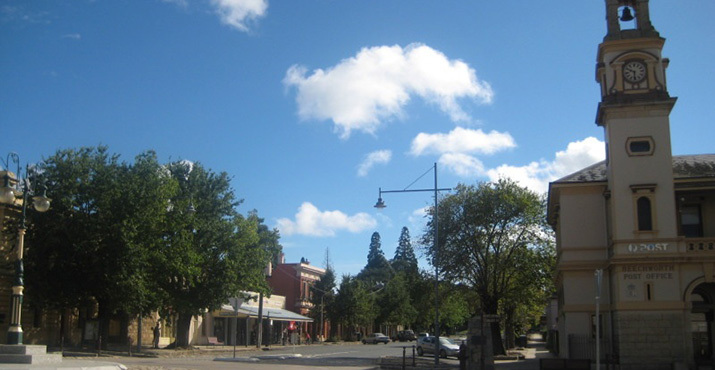 Beechworth’s olde Grand-Dame-splendour has not gone unnoticed by the National Trust: 32 of its buildings are classified – the town’s wide streets are lined not only with trees but also with splendid old buildings of historical significance. Check out the lacework of the Tanswell Hotel and the clock tower of the post office. 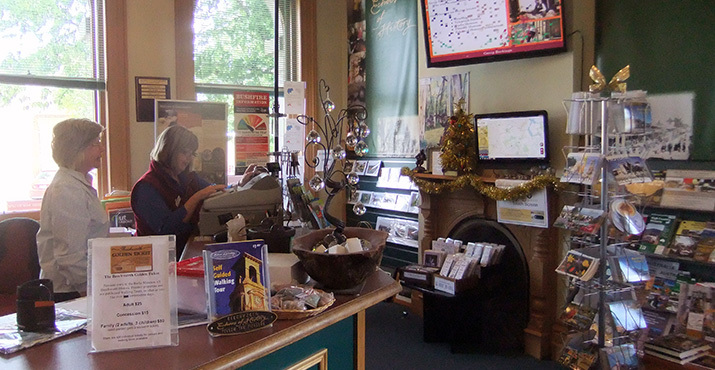 Two National Trust museums include the powder magazine built in 1859 for gold miners to store their bulk gunpowder and the Carriage museum on Railway Avenue, containing 20 horse-drawn vehicles that were used in the area. Hapless explorer Robert O’Hara Burke is not the only man of interest linked to this historic town. 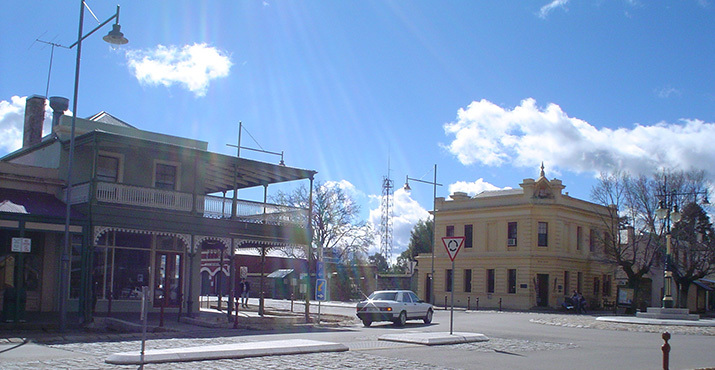 Beechworth is well-known for its connections to the Kelly family and gang. Indeed, Beechworth today is known primarily as a time capsule for Ned Kelly buffs: every year on the first weekend in August the “Annual Beechworth Ned Kelly Weekend” is held. This activity-filled celebration of all things Ned is held in August because Ned’s Committal Hearing was from the 6-11 August 1880 in the courthouse on Ford Street. The Beechworth Courthouse has all the original furniture and fittings from when Ned stood in the dock in 1880. Take a visit and spend some time in the Judge’s Chambers. This was the site where the outlaw was tried and found guilty of murder, leading to his Supreme Court trial and subsequent execution by hanging in Melbourne in November 1880. It wasn’t his first time standing in the dock – his first court appearance in Beechworth was as a teenager for horse thieving. The courthouse is merely one of a number of Ned’s haunts in what is now Beechworth’s Historic and Cultural precinct. Everywhere you turn in the streets of this fine tourist town you can become more knowledgeable about Australia’s most famous bushranger. HM Beechworth Prison, now also a time capsule, was a gaol for nearly 150 years in which all four members of the Kelly gang plus Ned’s mother were imprisoned for a while. Ned spent two years here on the top floor in Cell 101. Ellen (his mother) only spent a short time here before being taken to Melbourne to complete her 3-year sentence for her part in the Fitzpatrick incident. Cell 104 held condemned men as it was near the gallows; eight executions took place at HM Beechworth Prison. For more insight into life during the Kelly era check out the town hall – beneath it you can stand in a cell that secured Ned’s mentor, bushranger Harry Power, in 1863 and 1864. Also visit Burke Museum in Loch Street, which was erected in 1857. 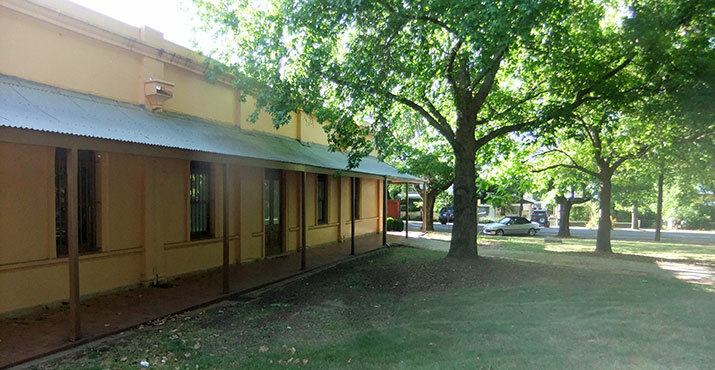 It has a well-presented collection of gold rush relics and the Beechworth Chinese community but also boasts artifacts relating to the Kelly gang on permanent display, such as the original plaster cast of Ned Kelly’s death mask, the original £8,000 “Wanted!” poster, replica armour, photos, documents and court records. A fascinating country town, beautiful Beechworth is a bottler: offering experiences and sights of centuries past, it is a place to discover both history and natural beauty. 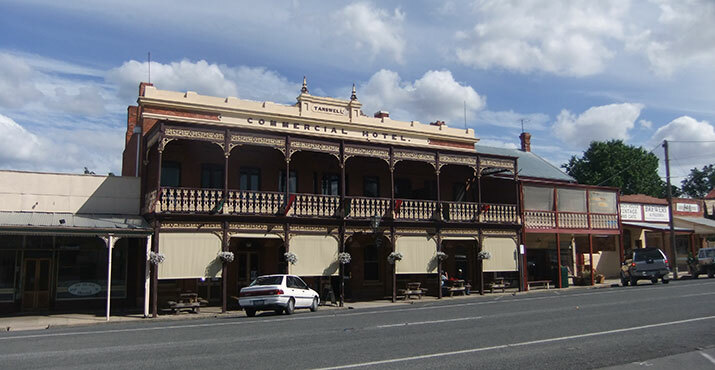 Beechworth is 36m from Wangaratta or 50km from Glenrowan. 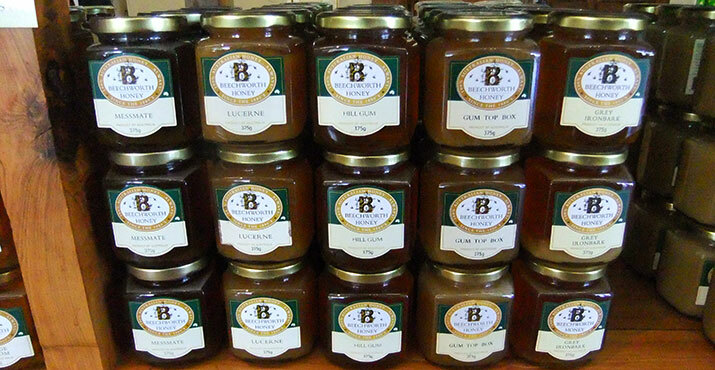 Beechworth is 3 hours’ drive north of Melbourne, 4.5 hours south of Canberra and 7 hours from Sydney. From Melbourne you drive up the Hume Highway and turn off at Wangaratta. The closest commercial airport is at Albury. On public transport you can take a VLine train to Wangaratta and a bus to Beechworth on Wangaratta Coachlines. 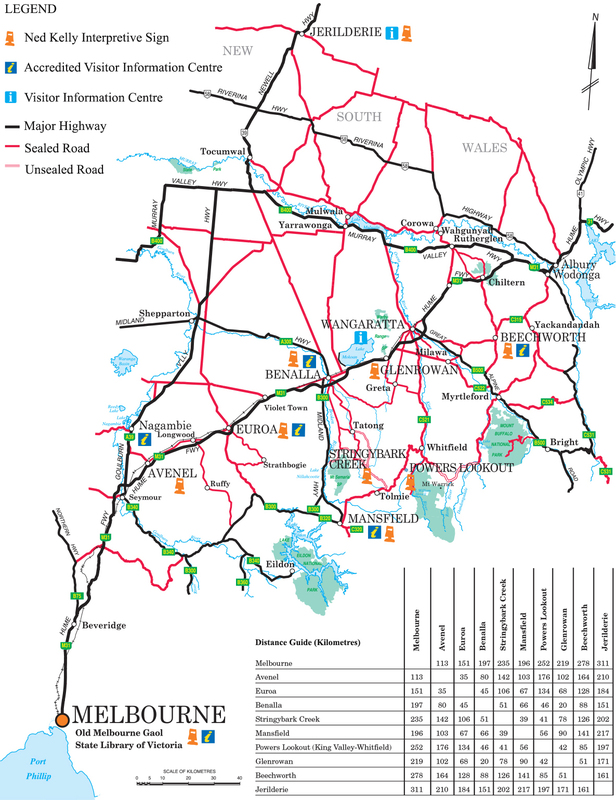 © Copyright 2016 Ned Kelly Touring Route. All Rights Reserved. Site by Digital Gold.